Losing a love one is never easy. The grieving process can feel lonely and overwhelming. 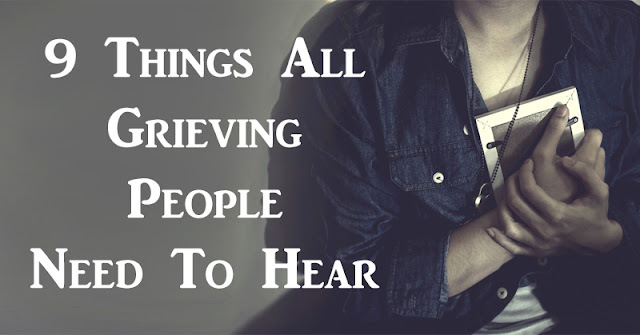 Many people struggle with knowing what to say to someone who is grieving. Grief can be an uncomfortable emotion. Forcing someone who is grieving to talk about their loss and share their emotions can overwhelm them. Everyone grieves differently. Don’t try to force someone to tell you how they feel. If they want to sit in silence, let them. People often hold back tears and emotions in an effort to “stay strong” in front of others. Let your friend or family member know that they are in a safe space to cry and to experience their pain. Make sure they feel comfortable crying and know that they have nothing to be embarrassed about. Many people have a hard time asking for help. Someone who is grieving may not even know what they need, and they don’t have the energy to figure it out. If this is the case, offer to do something specific, like go grocery shopping for them or bring them dinner. Saying you’re sorry sounds simple, but it’s direct and honest. It’s straight to the point and it shows that you care. If you don’t know what else to do, just show up and say “I’m so sorry for your loss.” It can end up meaning a lot to someone who is grieving. The grieving process takes time and it’s different for everyone. If your friend or family member isn’t ready to talk, don’t push them. Eventually, they will be ready, so just let them know that you are there for them whenever that time comes. Saying “I know how you feel” can end up being offensive to someone who has just lost a loved one. But saying “I feel your pain” is different. It lets the other person know that you feel for them and you are sorry for what they’re going through. Grieving can feel hopeless and lonely. When someone has lost a loved one, let them know that you are thinking about them. This can help them realize that they are cared for, and they are not alone. It’s important to let a grieving person know that they don’t have to handle their pain alone. Let them know that you are there for them, day or night, whatever they need. They may just want someone to sit with. Let them know that you are only a phone call away. Sometimes, we don’t know what to say. And that’s OK. This phrase is honest and heartfelt. There’s not much you can say to help take someone’s pain away, but you can be with them and let them know that you are there for them no matter what.